These high grade aluminum 7075 T6 Hard Anodized Ball Ends are the perfect replacement for your TC6 Ball Ends. They are smoother and lighter than all the other available ball ends in the market today. These ball ends will work on the AE TC6, Hot Bodies TCX (and other HPI/HB TC's), Durango line of 10th Scale vehicles as well as all other cars that use a 4.3mm ball end with a 3mm thread on them. 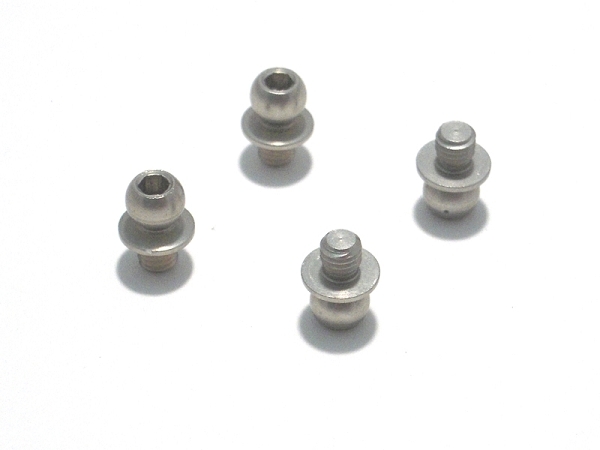 These ball ends are 1mm lower than the AE Black Ball Studs and have a 3mm long thread. They work great on the steering bell crank on your TC6, in order to increase suspension up stroke without hitting the front bulkhead and also allow you to run lower inside ball end position when used with the optional Reflex Racing Vertical Stud Mounts on both holes.